When smoking a premium, handmade cigar, some like to keep the band on, but others like to take it off. Is this "right" or "wrong" cigar etiquette? We say it doesn't matter: smoke your cigar how you want to smoke it, band on or off. Some smokers prefer keeping the cigar band on because it affords a bit of protection from their own fingers while they hold their cigar. Others would rather remove the band so no one knows what brand they are smoking. If you do want to remove the band, we suggest you wait until your cigar is lit and has been smoking for a few minutes. This will reduce the likelihood of the wrapper leaf being damaged during the removal process. Why is that? Because bands are attached with an adhesive called gomma, or gum. 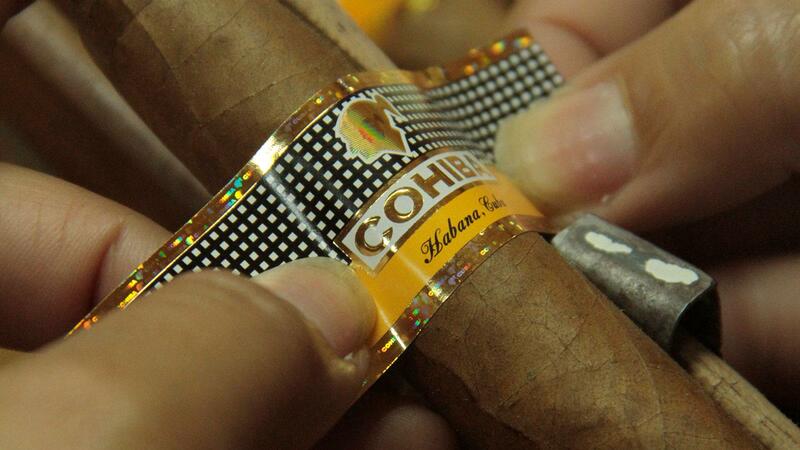 If too much gomma has been used, some may have seeped from the band onto the cigar's wrapper. If this has happened, the band, when removed, may take some of the wrapper with it. Smoking the cigar for a few minutes first will soften the glue and loosen its hold on the wrapper, thus allowing you to slowly remove the band without tearing the outer leaf.